For me, Halloween has always been one of my favorite days of the year. As a child I ran around the neighborhood collecting as much as possible and spend the next few days trading candies with my siblings and friends before gorging on my loot. As an adult, I still dress up for a couple of parties and to hand out candy at my own house on Halloween night. But Halloween can be scary for some… and I’m not talking about spooky costumes and masks. I’m talking about kids with food allergies. Imagine having a moderate to severe food allergy. Receiving Halloween candy could be life threatening to someone with a food allergy. -15 million American are affected by a food allergy. -6 million of those Americans are children. – 1 in 13 children has a food allergy. – Every 3 minutes a reaction to a food sends someone to the Emergency Room. – The top 8 food allergens are: milk, eggs, peanuts, tree nuts, soy, wheat, fish and shellfish. Although a person could be allergic to any food, these are considered most common. So what can you do? 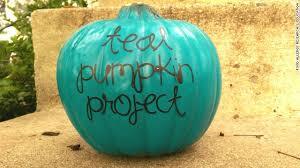 As a parent of a child with multiple food allergies, I was thrilled to hear about The Teal Pumpkin Project. FARE is raising awareness and promoting food allergy safety by asking people to give out nonfood treats to trick-or-treaters and paint a pumpkin teal (the color of food allergy awareness). They also ask that homes with teal pumpkins clearly label themselves with a free printable sign available on their website [LINK TO http://www.foodallergy.org/teal-pumpkin-project#.VEmg2fl4ryB ].The teal pumpkin will not only mark homes that are giving out treats that are safe for kids with food allergies, but FARE also hopes to raise awareness about food allergies as well. In addition to feeling included, kids with food allergies can have a positive experience while trick-or-treating and feel safe doing so. Don’t worry… you don’t need to spend tons time and of money to participate! In fact, I’m buying teal paint and painting several pumpkins to distribute (as my neighbors also have kids with food allergies) and I’ll be handing out bubbles, spider rings and glow necklaces that were purchased inexpensively online. I will also have a separate bowl of traditional Halloween candy to give as well. Consider sharing paint and treat costs and online orders with friends and family who plan on participating. Please be sure that your allergy safe treats are not edible. Even things as innocent as a bag of pretzels can be coated with egg or made in a factory that also handles peanuts and tree nuts.